The Sonora sounds great and can certainly hold its own with units that are more expensive. Looks and feels the part. Sounds great on any source. Two high-quality channels and won't break the bank. Separate power supply may annoy some. Sonora looks and feels like a serious piece of kit. Power comes from a separate supply. Out of the box, the Sonora inspires confidence and looks and feels great. The preamps are housed in a solid satin-black metal desktop housing that belies its price. The switchgear feels spot on, with no wobbly pots or cheap-feeling switches. Power is supplied to the Sonora via a separate power unit, the SPS-3. First you switch on the power supply, then the Sonora itself that has a bright blue power LED to signify that it's ready for sonic action. While we were initially surprised that Sontronics chose to go with a large external power supply rather than with a built-in one, it makes sense for two main reasons. 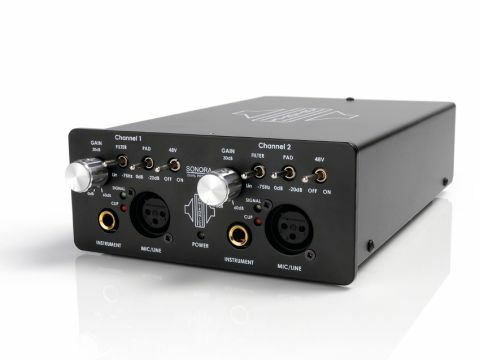 Firstly, it reduces electro magnetic interference, making its way into the signal path (thus improving the subjective sound quality) and secondly, it means the preamp box can be made smaller and lighter for sitting on desktops and for transporting. Moving swiftly onto the front panel, you'll find two identical channels. Each provides simple connectivity and switching, including a stepped preamp gain control with a huge 60dB of gain, (stepped in 5dB increments) a high-pass filter that rolls off at 75Hz for eliminating low-end rumble, a -20 pad for taming very hot sources a phantom power switch and, finally, an instrument jack input and a balanced female XLR input for mic/line sources. Output-wise, there's a choice of XLR or jack per channel on the rear panel. Very basic metering is provided in the form of a green LED to let you know a signal is passing, and a red LED to indicate that the preamp is approaching clipping. Unfortunately, there's no ground lift or phase ﬂip. However, with such a small footprint, we can't really see how Sontronics could have crammed in any more. The preamp is a discrete, solid-state, class-A affair (x2) that's based loosely on vintage designs. To our, ears it sounds great. We'd describe the overall character as dark, vintage and round. Testing the Sonora side-by-side with our trusty Avalon U5 preamp DI (using our Fender Rhodes Piano) the Avalon brought out the bell-like tones in a very detailed way, while the Sonora sounded 'fatter', rounding out the top end more in a way that we would expect from older vintage pres. We know that the Avalon is very transparent, modern-sounding and generally true to the source, while the Sonora seems more coloured (in a nice way) and certainly enhances the low end of instruments more. However, it still manages to capture attack transients in sounds superbly, and you'd be forgiven for thinking that you were running your gear through an old expensive preamp, albeit one with very low noise that's been recently serviced and recapped! You can also really jack the gains with the character staying consistent throughout the gain range. At the same time, there's little noise leaking through into the signal path - the mark of a well-made piece of kit. Let's not forget that you get not one but two channels for your money with the Sonora. Coupled with a compact portable A/D D/A converter box, you potentially have a very compact and versatile DAW input and output system that could be used for almost any recording application, both in your home studio and on location. The Sonora is also great for imparting some analogue warmth and fatness on digital recordings that are often very clear and punchy, but ultimately, lack a certain mojo. You could run your recordings out of your computer, through the Sonora and then back in. Stereo operation couldn't be easier either, as each gain control is click stepped for reference matching. To sum up, we really like this preamp. It's very well-built, exhibits very low noise and has a very musical character that's well-suited to just about any source. It excels on spiky sources such as acoustic guitar, Clavinet and thin voices, rounding and fattening the sound while keeping those vital initial attack transients intact. It also makes a great stereo front-end for recording in and out of your computer - something we see as being one of its key uses. For its first foray into preamp design and manufacture, we'd say that Sontronics has got the sound and balance of features almost spot on. It's a high-quality two-channel preamp DI at a reasonable price.